I love yogurt with fruit like strawberries, blackberries. And sometimes just plain yogurt withy nothing added. Most yogurt brands at store are either loaded down with suger, or are with additives (such as Jello), or too expensive (organic). Yougurt making call for a thermometer, but since I don't have one, we are going to use "stick&stone" approach and it always come out perfect. All you need is one quart of milk and one tablespoon of store bought plain yogurt. And a jar with lid and a large skillet. First pour the milk in skillet on medium heat untill milk start to boil. Just as soon as milk starting to boil, pull it off the heat and let milk cool down a bit. Ideal milk temperature we want is around 115-120 degrees which is slightly cooler than what comes out of hot water fauset. So using hot water fauset temperature as referense point, as soon as milk cooled down to around 115-120 degree (almost same as hot water fauset temperature), pour it into the jar and add spoonfull of [store bought] yogurt to the mix to get chemical process going. And put lid on it. Wash out the skillet and fill it with hot water and then emerse jar in the skillet. The trick here is to keep water in the skillet at same temperature (115-120 degrre) for about six hour for milk to turn into yogurt. I have electric stove, so when I put skillet filled with water on top of burner, the lowest heat setting will keep the water warm. Last edited by Smokey; 02-11-2014 at 08:07 PM. That's pretty cool. You leave your stove on for 6 hours? Yes, on lowest setting. Best to do this while at home so you can check on it hourly so water don't get too hot, too cold or too low. Or you can skip the skillet with water, and put the jar in the oven on "warm" setting. As long as milk stay at around 115 degree for 6 to 7 hours, you are good. This reciepe is very forgiving, so if milk temperature fluctuate during process, it still come out pretty good. I wonder if putting the jars in a slow cooker would work? I eat tons of yogurt. Don't often make it though. Try putting honey, or espresso, or brown sugar in the bottom of the jar. Makes for some nice flavors. I like espresso. I don't think it will. Slow cooker run at between 180-210 degrees which too hot for bath water and it will kill the chemical bonding. If you don't like to keep stove on for six hours, use a bigger container for bath water that have lid. Bring the water temperature up to around 120 degrees (same as hot water fauset), put the lid on it so to keep heat loss minimum, and shut off the stove. But you have come back every hour to turn the stove back on to bring water back to desire temperature and shut it off again. Honey and yogurt sound good. I may have to try that. Last edited by Smokey; 02-12-2014 at 05:51 PM. Yogurt is produced by living bacteria that ferment the milk sugars. The yogurt bacteria grow best at the warm temperatures but are killed if the temperature gets too high. So...it's not chemical bonding that's killed, it's the bacteria that get killed. 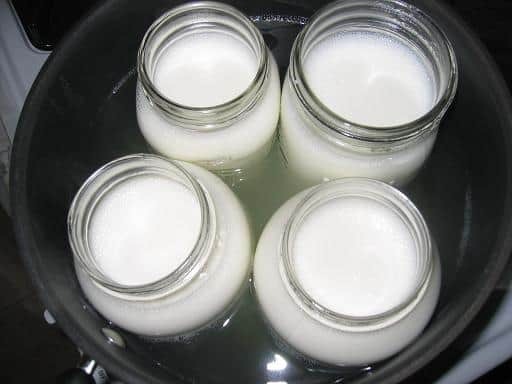 When you add a spoon of store bought yogurt you are transferring live bacteria, which then start fermenting your milk. Different yogurt companies have their own specific strains of bacteria that can influence the way the yogurt turns out, so you can try different brands as starters and see if it makes a difference for you. Yeah, I easily go through a more than quart a week. I started making my own granola and my staple breakfast is yogurt and granola. I make my own granola because 1) I like granola, 2) Most store bought granola are just not dense enough to satisfy and those that are are a bazillion dollars a pound. You definately should. Delicious! I just can't help but think that the cost of running my stove for 6 hours is going to completely offset the cost of just buying the yogurt. I would try it as an experiment, but I'm not convinced that it's going to save me money. I buy my yogurt at Costco and it's pretty cheap there. I also eat a lot of yogurt...only 0% fat greek yogurt. I try to eat one to two servings a day. I recently had a stomach virus so after I stopped throwing everything up, I upped it to 2-3/day for the probiotics, until my stomach settled. I like to add fresh fruit and a mixture of hemp hearts, chia seeds, and flaked coconut (unsweetened). I also add a tbsp of raw pumpkin seeds a few times a week to keep my iron up. Many years ago my wife & I made yogurt at home. We had the best success using a purpose-made yogurt maker which maintain the proper temperature without any special effort. We gradually gave up on it because we both preferred a sweetened, flavored yogurt. Today I eat mostly commercial 0% Greek yogurt with fruit; my wife preferred a higher fat regular yogurt but she doesn't have cholesterol issues. Like Forever Autumn we buy most of our stuff at Costco. I didn't know that. I been using greek style yogurt for starters which have a firmer consistency and it make very firm and tangy yogurt. I don't like runny yogurt like Dannon brand. I just can't help but think that the cost of running my stove for 6 hours is going to completely offset the cost of just buying the yogurt. Today I eat mostly commercial 0% Greek yogurt with fruit. There's probably ways to make your yogurt come out thicker, maybe letting it ferment longer or using richer milk. Or temperature... I don't know. Greek yogurt is strained to remove the liquid and that's what makes it firmer and more nutritious per cup--it's just less liquidy yogurt. But, it's interesting to note that the Greek yogurt starter cultures also make a tangy-er flavor compared to Dannon starters. One can, of course strain their own homemade yogurt to get a Greek yogurt. Use cheese cloth, a t-shirt (clean), or similar.